Ceramic Owl Sculpture - Hand Built Rustic Stoneware Raptor - Bird Figurine - Home Office Decor Pottery - Fine Art Owl Totem "Aster"
Aster is a textured stoneware owl sculpture of the glossiest spruce green. Rainforest Celadon glaze was layered over Snow celadon and it pooled in the recessed areas of her texture to create soft definition all over. She has a floral pattern present at the crown of her head and a subtle leaf pattern on her torso. She was formed from an impressed slab joined at the back. Her beak was pinched and affixed via the score and slip method. 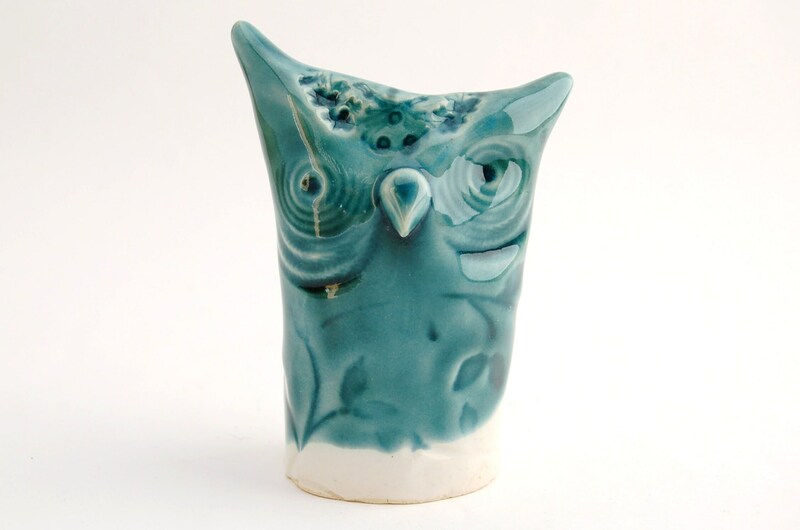 Aster would make a lovely gift for any owl or nature lover, a serene and stunning piece for any home or office. Aster measures 3.5 inches tall, 2.5 inches wide at her ears and sits on an oval that measures 1.5 inches in most places. Ceramic Owl Sculpture - Hand Built Rustic Stoneware Raptor - Bird Figurine - Home and Office Decor Pottery - Fine Art Owl Totem "Otto"
Ceramic Owl Sculpture - Hand Built Rustic Stoneware Raptor - Bird Figurine - Home Office Decor Pottery - Fine Art Owl Totem "Emerald"
Ceramic Owl Sculpture - Hand Built Rustic Stoneware Raptor - Bird Figurine - Home Office Decor Pottery - Fine Art Owl Totem "Godfrey"
Ceramic Owl Sculpture - Hand Built Rustic Stoneware Raptor - Bird Figurine - Home Office Decor Pottery - Fine Art Owl Totem "Tammy"
Ceramic Owl Sculpture - Hand Built Rustic Stoneware Raptor - Bird Figurine - Home Office Decor Pottery - Fine Art Owl Totem "Lucretia"
Ceramic Owl Sculpture - Hand Built Rustic Stoneware Raptor - Bird Figurine - Home Office Decor Pottery - Fine Art Owl Statue "Marsette"
Ceramic Owl Sculpture - Hand Built Rustic Stoneware Raptor - Bird Figurine - Home Office Decor Pottery - Fine Art Owl Statue "Charity"
Ceramic Owl Sculpture - Hand Built Rustic Stoneware Raptor - Slab Built Figurine - Home Office Decor Pottery - Fine Art Owl Totem "Vera"
Ceramic Sleeping Fox Sculpture - Textured Stoneware Clay Red Fox Figurine - Woodland Fox Hand Built Statue - Rustic Pottery Fox "Fabienne"
Merri the owl is just too adorable! Skillfully created and shared with the world! I just love her! And Shennon was very good to me...will definitely be shopping for new treasures with her again soon!! Thank you!! Ceramic Owl Sculpture - Hand Built Rustic Stoneware Raptor - Bird Figurine - Home Office Decor Pottery - Fine Art Owl Totem "Merri"
This owl looks amazing, and serves a useful purpose too. He was packed with much love and shipped very quickly. Thrilled that he now lives here!! 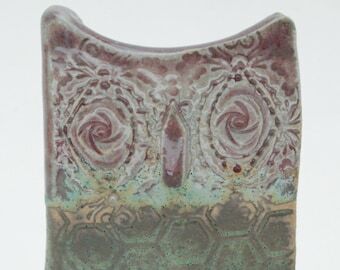 Ceramic Owl Container - Fine Art Eyeglasses Holder - Rustic Raptor Desk Organizer - Hand Built Functional Owl Vessel "Pythagoras"
This has to be one of my favorite Etsy purchases ever! I just love Shelley the owl, and Shennon is an amazing artist and so friendly too! Highly recommend!! Ceramic Owl Sculpture - Hand Built Rustic Stoneware Raptor - Bird Figurine - Home Office Decor Pottery - Fine Art Owl Totem "Shelley"
Paypal payments are preferred. PayPal is a third party credit card processor that keeps all of your transaction information secure. I also accept payments via United States Postal Service Money Order and direct checkout. Orders will be shipped within 3 days of payment confirmation or receipt. If an item reaches you in a damaged condition, please contact me immediately with photos showing the damage of item/s and photos of the box it came in. I will refund your purchase. The shipping box must be kept for insurance purposes. I truly want you to be happy with your purchase, but please keep in mind that the pieces are made by hand and there will be imperfections and variations. If you are not satisfied with your purchase, you are welcome to return it for a full refund within 7 days of purchase. Item must be in original condition. Buyers are responsible for return shipping. I ship via USPS mail, Priority 2-3 Day, Monday- Friday. Shipping costs are approximated and include the actual cost of shipping plus a small amount to cover the cost of shipping supplies and materials, insurance and delivery confirmation. I like to use recycled shipping materials as often as possible. I think it is important to recycle! If breakable, it will be properly mummified in protective wrappings to keep it safe. Feel free to contact me if you would prefer all new packing materials. If the shipping price turns out to be significantly less to ship to your destination, I will refund the difference via PayPal or credit card, whatever method was used for payment. Shipping is usually within 1-3 business days of receipt of payment. You will be contacted once your item has shipped. I do not ship internationally at this time, however I would be pleased to converse with you about the possibility. Feel free to send me an Esty Conversation with your inquiry. Ceramic Owl Sculpture - Hand Built Rustic Stoneware Raptor - Bird Figurine - Home Decor Pottery - Fine Art Ceramic - Primitive - "Alambee"
Ceramic Owl Sculpture - Hand Built Navy Stoneware Raptor - Bird Figurine - Home Office Decor Slab Pottery - Fine Art Owl Totem "Hector"
Ceramic Owl Sculpture - Hand Built Stoneware Raptor - Blue Owl Figurine - Home Office Decor Pottery - Fine Art Owl Totem "Grumpus"
Ceramic Owl Sculpture - Hand Built Rustic Stoneware Raptor - Large Bird Figurine - Home and Office Decor Pottery - Fine Art Ceramic "Zulema"
Ceramic Owl Sculpture - Hand Built Whimsical Stoneware Raptor - Clay Bird Figurine - Home Decor Pottery - Fine Art Ceramic Totem - "Willard"
Ceramic Owl Sculpture - Whimsical Stoneware Raptor - Clay Bird Figurine - Home Decor Pottery - Fine Art Owl Totem "Matilda the Magnificent"
Ceramic Owl Sculpture - Fine Art Raptor Figurine - Hand Built Owl Statue - Home Office Decor - Textured Rustic Owl Totem Decoration "Flor"